Enabling the Deaf, Hard of Hearing, Late Deafened, and Hearing to communicate without barriers. UbiDuo allows anyone to have a face-to-face conversation in real time without barriers enabling 100% communication equality! Try the new UbiDuo whenever you need a solution to facilitate face-to-face communication between deaf/hard-of-hearing and hearing people. This revolutionary device will help to eliminate bluffing, frustration and Communiphobia, as well as promote communication equality. Use it to empower people to share their thoughts and emotions seamlessly in real time just as in a normal conversation. Standard Wireless model of the UbiDuo connects each half with a built-in proprietary networking protocol that has a range of up to 300 feet. Your UbiDuo can be used anywhere, anytime - even in the middle of the ocean. It uses it’s own wireless protocol to communicate, so no WiFi connection is required. 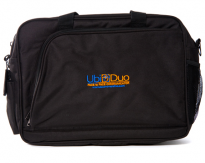 Your UbiDuo has a long lasting rechargeable battery allowing you to have a barrier free conversation for 10-12 hours. For those who have low or impaired vision, your UbiDuo can be adjusted to display in a large or medium font along with the font colour and/or background color. Your UbiDuo starts up in under 3 seconds and you’re able to have a face-to-face conversation. Each screen on the UbiDuo is touch enabled. You can easily configure your UbiDuo to the way you’d like it to appear. Your UbiDuo weights just under 4 pounds and both halves connect using a J-Hook for easy transportation. You’ll get the same benefits of the wireless package: empowerment; the promotion of communication equality; seamless, real-time communication; and the elimination of bluffing, frustration, and Communiphobia. This high-tech device has all of the bells and whistles of the wireless version plus one: the wired connection between the two halves.